The Defender is a story within a story! Yes, it is part of the Wyoming Series and continues my tradition of danger, romance and suspense. Here is the “other” story! Over a year ago, I received an email from Harlequin corporate headquarters. Donna Hayes, Publisher and Chief Executive Officer of Harlequin had spotted a pair of Peregrine falcons who were about to nest in a building across the street. Amazed, I read the missive. The Tundra Peregrine has been driven to the edge of extinction by DDT and other harmful pesticides used by farmers in Canada. As I read the email, I wanted to let Donna know, that I too, was involved in supporting and donating to High Country Raptors, Flagstaff, Arizona, USA. I sent her a YouTube link. My good friend from Milan, Italy, Monica Amarillis, had taken her cell phone and videotaped me with Luna, a European Eagle Owl: http://www.youtube.com/watch?v=o2KTsA72klY&feature=related and http://www.youtube.com/watch?v=NskpWkJvl7Yk . The raptors you will see are birds cared for by Susan Hamilton, falconer and who holds an eagle license, of High Country Raptors, Flagstaff, Arizona. After Donna saw the videos, she sent me an email telling me I had to connect with Ann Brokelman, a professional Canadian wildlife photographer. I did, and the rest was history! Because we all support not only with time, but donations to the volunteers who care for raptors, we have a wonderful, ongoing triangular connection in this incredibly magical realm of birds. Raptors do change your life. I know that for a fact. And always for the better! For those readers who are avidly waiting for my next book in the Wyoming Series, I wanted to get more deeply into another passion of mine: romantic suspense! 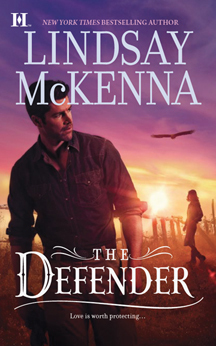 If you enjoy action, adventure, threat, hot romance coupled with danger, you’ll enjoy The Defender. Katie Bergstrom is a twenty-six year old raptor rehabilitator who tries to help wounded and injured raptors back to health in Jackson Hole, Wyoming. She was abandoned at birth by her mother. Rebelling, lost and always trying to find her mother, Katie goes through many foster homes and gets into teen trouble. She eventually winds up in Jackson Hole, where her luck changes and she’s given a new lease on life. Raptors, with their own unique magic, focus her life and give her reason to thrive, despite her dark, unhappy past. Joe Gannon, born in Jackson Hole, is a Marine Corps captain who was wounded in Afghanistan. He comes stateside to find out he can never fight for his country again. The FBI offers him a job. He has been specially chosen to come home to try and get close to Katie Bergstrom. It is her birth mother, Janet Bergstrom, who is suspected of criminal activity. Can he lie to Katie? Is Katie really a part of her mother’s illegal activities? Most of all, Joe finds himself caught in an impossible situation because he must fight his attraction to Katie and remain undercover to discover the truth. Where do lies and truth begin and end? Can their growing love survive? You are currently browsing the Lindsay McKenna blog archives for November, 2012.